This article describes the event-based triggers that you can create in your Data Factory pipelines. Event-driven architecture (EDA) is a common data integration pattern that involves production, detection, consumption, and reaction to events. Data integration scenarios often require Data Factory customers to trigger pipelines based on events. 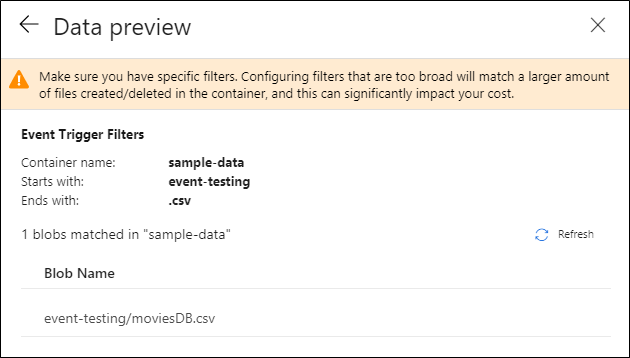 Data Factory is now integrated with Azure Event Grid, which lets you trigger pipelines on an event. The integration described in this article depends on Azure Event Grid. Make sure that your subscription is registered with the Event Grid resource provider. For more info, see Resource providers and types. 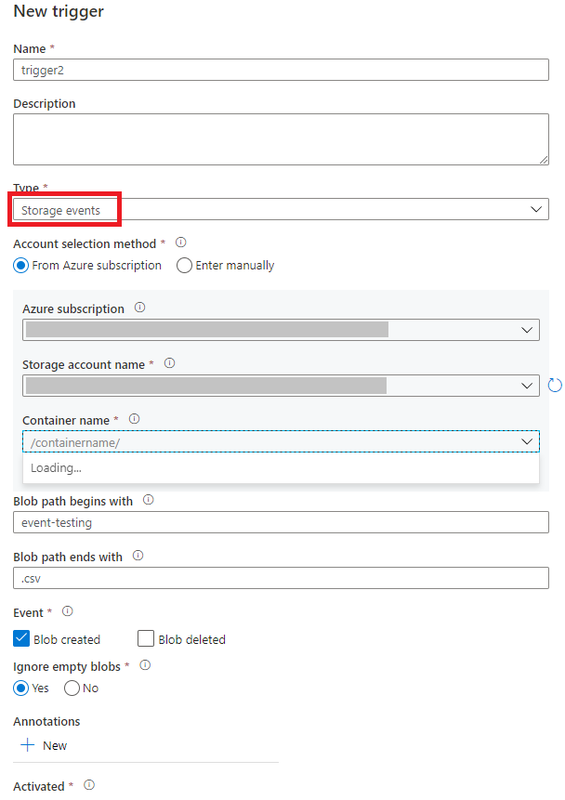 A typical event is the arrival of a file, or the deletion of a file, in your Azure Storage account. You can create a trigger that responds to this event in your Data Factory pipeline. This integration supports only version 2 Storage accounts (General purpose). With the Blob path begins with and Blob path ends with properties, you can specify the containers, folders, and blob names for which you want to receive events. You can use variety of patterns for both Blob path begins with and Blob path ends with properties, as shown in the examples later in this article. At least one of these properties is required. As soon as the file arrives in your storage location and the corresponding blob is created, this event triggers and runs your Data Factory pipeline. You can create a trigger that responds to a blob creation event, a blob deletion event, or both events, in your Data Factory pipelines. When an event trigger fires for a specific blob, the event captures the folder path and file name of the blob into the properties @triggerBody().folderPath and @triggerBody().fileName. To use the values of these properties in a pipeline, you must map the properties to pipeline parameters. After mapping the properties to parameters, you can access the values captured by the trigger through the @pipeline().parameters.parameterName expression throughout the pipeline. For example, in the preceding screenshot. the trigger is configured to fire when a blob path ending in .csv is created in the Storage Account. As a result, when a blob with the .csv extension is created anywhere in the Storage Account, the folderPath and fileName properties capture the location of the new blob. For example, @triggerBody().folderPath has a value like /containername/foldername/nestedfoldername and @triggerBody().fileName has a value like filename.csv. These values are mapped in the example to the pipeline parameters sourceFolder and sourceFile. You can use them throughout the pipeline as @pipeline().parameters.sourceFolder and @pipeline().parameters.sourceFile respectively. events The type of events that cause this trigger to fire. Array Microsoft.Storage.BlobCreated, Microsoft.Storage.BlobDeleted Yes, any combination of these values. blobPathBeginsWith The blob path must begin with the pattern provided for the trigger to fire. For example, /records/blobs/december/ only fires the trigger for blobs in the december folder under the records container. String You have to provide a value for at least one of these properties: blobPathBeginsWith or blobPathEndsWith. blobPathEndsWith The blob path must end with the pattern provided for the trigger to fire. For example, december/boxes.csv only fires the trigger for blobs named boxes in a december folder. String You have to provide a value for at least one of these properties: blobPathBeginsWith or blobPathEndsWith. 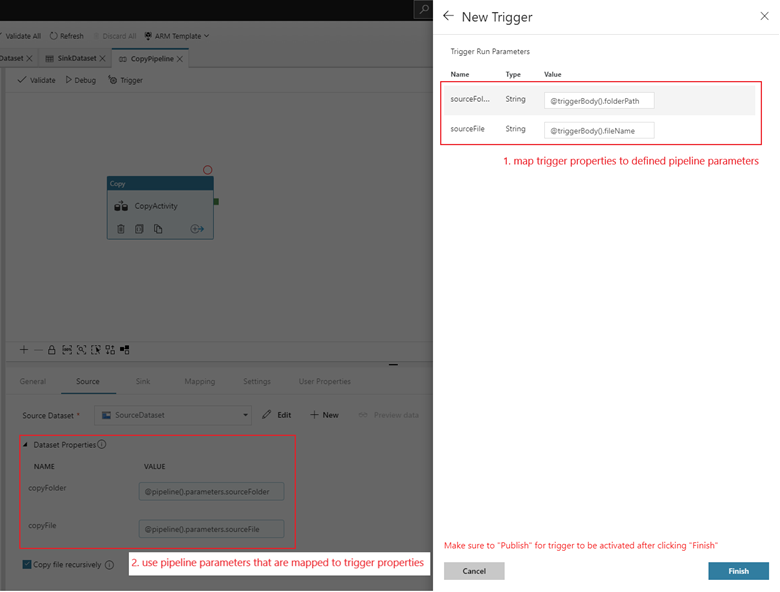 This section provides examples of event-based trigger settings. You have to include the /blobs/ segment of the path, as shown in the following examples, whenever you specify container and folder, container and file, or container, folder, and file. Blob path begins with /containername/ Receives events for any blob in the container. Blob path begins with /containername/blobs/foldername/ Receives events for any blobs in the containername container and foldername folder. Blob path begins with /containername/blobs/foldername/subfoldername/ You can also reference a subfolder. Blob path begins with /containername/blobs/foldername/file.txt Receives events for a blob named file.txt in the foldername folder under the containername container. Blob path ends with file.txt Receives events for a blob named file.txt in any path. Blob path ends with /containername/blobs/file.txt Receives events for a blob named file.txt under container containername. Blob path ends with foldername/file.txt Receives events for a blob named file.txt in foldername folder under any container.